Nothing brings a yard together like a beautiful patio. Gorgeous landscaping full of blooming flowers, green shrubs, and a well-manicured lawn are all great things, but a well-designed patio will allow you and your guests to actually experience your landscaping while you spend time outdoors. If you love to spend time in your yard during the warmer months, take a look at these patio landscape design ideas. If you love lounging around outside, a paved patio could be the perfect fit for your yard. Here at Hackmann Lawn, we work only with high-quality natural stones to create beautiful patios. It’s simple to customize your patio landscape design to fit your size, style, and budget. Do any of these gorgeous stone paved patios inspire you to create an area for a few patio chairs? Make your yard pop with bursts of color. You can create pretty landscapes by lining walkways with brightly colored flowers or dedicate flower beds to seasonal blooms. Another great way to work more flowers into your patio landscape design is to place potted plants throughout the patio. Using potted plants not only give you flexibility in the plants you choose throughout the season, but it also allows you to personalize the receptacles. There are so many fun DIY projects that allow you to paint and personalize your potted plants. 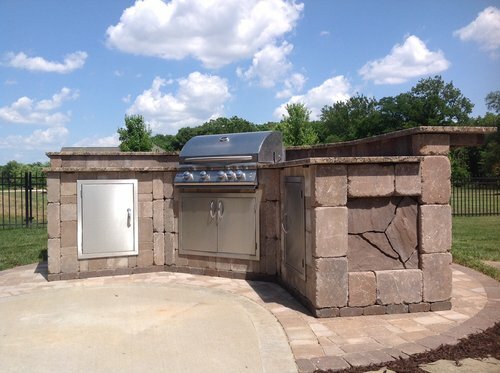 If you really want to take your patio landscape design to the next level, you can install a fully functional outdoor kitchen or barbecue. If you love being the host of neighborhood parties and family gatherings, this is a great way to make more use of your outdoor space. You can design the layout to include everything from outdoor sinks to built-in coolers/refrigerators so that your gatherings can center around your beautifully designed outdoor space.